Time of Origin: Future, the planet of Thoros-Beta, around the twenty-fourth century. Appearances: "Vengeance on Varos", "Mission to Magnus", "Trial of a Time Lord: Mindwarp" and " Antidote to Oblivion". History: A native of the planet Thoros-Beta, Sil is generally regarded as one of the most unpleasant creatures ever encountered by The Doctor, one of the more prominent reasons for this reputation being his repulsive appearance, resembling as he did a kind of green worm with squat arms, an ugly face and a set of frilly scales on the top of his head. A glitch in his translator made him even more disturbing, but this was never corrected because nobody ever told him about it (Why the TARDIS’s translation abilities didn’t compensate for the error is unknown; possibly the language translator doesn’t work if the language spoken is already being translated by something else). When Sil initially appeared in the series, he was the representative of the Galatron Mining Corporation present on the planet Varos to extract concessions from the current Governor. Unbeknownst to the Varosians, the mineral Zeiton-7, one of their few natural resources, was not, as they thought, practically worthless, but was in fact extremely rare, and highly valuable to time travelers as a power source for their machines. Devoid of morality and determined to get the cheapest possible price for the zeiton ore, Sil greatly enjoyed the various tortures that were carried out for the enjoyment of the population of the planet to prevent them from doing anything about their situation, including a voting system where the governor was slowly tortured to death every time he received a vote against him. Eventually, Sil’s plans to get the ore were thwarted when the Sixth Doctor and Peri, seeking Zeiton-7 to refuel the TARDIS, arrived on Varos in the middle of the ‘maze’ where condemned prisoners were sent. Allying themselves with other prisoners - on the basis that they were the only people there not trying to kill them, The Doctor and Peri tried to escape the maze, but Peri was captured after she was nearly mutated into a bird-like creature by one of the traps. Fortunately, Sil’s plans to take control of Varos by killing the Governor with the next vote were thwarted when the guard controlling the torture machine had a change of heart, and the discovery of a new supply of Zeiton-7 prompted the company Sil worked for to order him to purchase the ore at any price. As thanks for his aid, The Doctor was given the ore he sought and departed. During their next encounter with Sil, The Doctor was forced to not only confront his fear of a childhood bully from the Time Lord academy - a renegade Gallifreyian known as Anzor - but also a potentially lethal alliance between Sil and the Ice Warriors. At this point, the rulers of the planet Magnus Eplison - a planet divided between the male Salvakans and female Magnii - on advice from Sil, sought the aid of a Time Lord to stop an alien spacecraft bombarding their planet with lethal radiation (Their humiliation of Aznor helped The Doctor overcome his childhood fear), but The Doctor tricked Anzor into entering his TARDIS after setting it on a fixed course for the dawn of creation. Attempting to acquire the resources to mass produce time machines, Sil managed to break into the TARDIS with the planet’s ruler, but accidentally shifted himself a few hours into the future, where they witnessed a planet that had been all but destroyed. Exploring the ice tunnels beneath the palace, The Doctor and Peri discovered the Ice Warriors that Sil had allied himself with, as well as learning their plan; by setting off several nuclear devices in sequence, the Ice Warriors pushed the planet into a more distant orbit, making it far colder and a perfect habitat for the Ice Warriors. 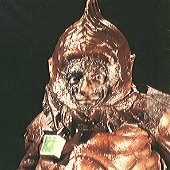 Sil had intended to profit from the disaster by selling cold-weather items such as heaters and clothing to the population in the aftermath, but when the Ice Warriors betrayed him, Sil revealed the existence of a second series of nuclear devices, allowing The Doctor to shove the planet back into its proper orbit. 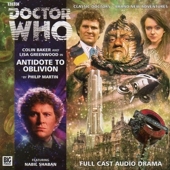 The Doctor and Peri departed, leaving Sil to get rich selling matrimonial and baby goods. Whether this attempt at ‘reformation’ - if it could be considered that; just because Sil wasn’t actively hurting anyone any more didn’t mean he wasn’t still a merciless monster - was a lie or simply didn’t take, the next time Sil met The Doctor and Peri, he was as ruthless as ever, selling arms to the planet of Thoros-Beta while overseeing his master Kiv’s attempt to transfer his brain into a new body, his old head being too small for his ever-growing brain. After being exposed to one of the devices in Sil’s laboratory, The Doctor’s personality was altered, making him callous and self-centered, resulting in him betraying the Thoros-Alphan rebels who were attempting to overthrow the Mentors. Although he eventually snapped out of his darker mental influence, The Doctor was apparently too late to save Peri from being used as Kiv’s new host; he was pulled out of time by the Time Lords for his newest ‘trial’ (Overseen by his own dark future incarnation, The Valeyard), leaving Peri/Kiv, Sil, and Crozier - the scientist who had overseen the procedure - to be killed by an enraged King Yrcanos, the Alphan leader who had fallen in love with Peri. However, it was later revealed that The Valeyard was tampering with the evidence to try and achieve his desired outcome for the trial, with various Time Lord factions disagreeing with the decision to kill Peri, resulting in multiple alternate versions of Peri 'surviving' her death depicted here in various forms. However, The Doctor remained uncertain for some time just what had happened to Peri, even if he could be fairly certain that Kiv was dead, leaving Sil and Crozier's fates a mystery at first. Having survived the temporally-complex events on Thoros Beta, Sil eventually made his way to Earth in the twenty-fourth century, where he provided financial aid to the corporations that had risen to control Great Britain after the governments collapsed, the corporation Concorpia even putting drugs in the water to keep the people docile. Having captured Anzor by luring his TARDIS back to Earth, Sil had allied himself with Crozier's daughter Cordelia, claiming that her father had died because of The Doctor's actions to 'encourage' her to help him in his plans against The Doctor. Sil intended to release various viruses on the general population with the goal of reducing the human race to only the basic essentials, allowing the corporations to devote more financial aid to repaying their loans, with Time Lords an important part of this plan as he believed that their powerful immune systems would help them develop a mass vaccination (Although Anzor had been rendered useless to the plan when he was turned into a small potato-like thing after he was put in an improperly-set transmogrifier). While Sil was able to lure The Doctor back to Earth by programming Anzor's TARDIS to send a distress signal directly to The Doctor's - Anzor having told them how to lure The Doctor in specifically in order to get revenge - his plan was soon complicated when The Doctor discovered a group of sentient viruses known as the Velandari had contaminated the program, seeking to expand from the micro world to attack the human race on a larger scale. After The Doctor and Flip's first attempt to escape failed when they were betrayed by Pan Connell - a former pharmacist who had lost his job when his wife Cerise Davies discovered the truth about the drugs in the water supply - The Doctor was forced to help develop the vaccine when Flip was infected with the Velandari. Fortunately, not only did the cure devised by The Doctor and Cordelia work, but The Doctor was then able to turn the tables on Sil when he tricked Sil into revealing that he had actually killed Crozier himself while Cordelia was watching them via camera footage, angered at Crozier failing to save Kiv and blaming The Doctor for it to channel Cordelia's intelligence into the desire for revenge. At the same time, Pan revealed to Cerise that he had used his new position to remove the pacification drugs from the water supply in his new role supervising their distribution, allowing the common people to rebel against the corporation as they realised what had been done to them. As Concorp's headquarters was attacked by the angered general population, Cordelia headed to the boardroom and infected the rest of the board with the Velandari in an attempt to kill Sil. Although the tower was destroyed when an incendiary device hidden in Cordelia's laboratory was detonated, Sil was rescued by a sky-car before the building exploded, intending for the corporations to profit even further when they came back to offer financial aid in the subsequent reconstructions after the riots ended. However, it was implied that he had been infected with the Velandari as he departed, creating the potential for him to face The Doctor once again in their future.